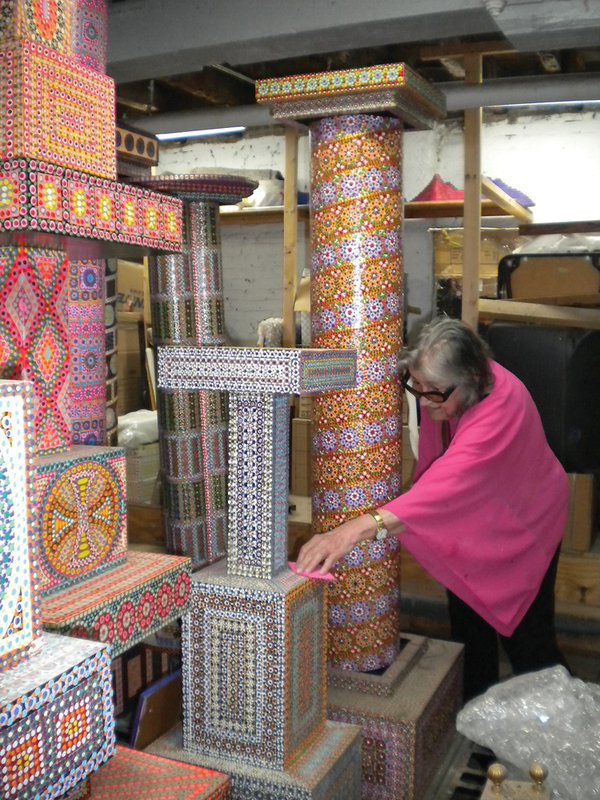 High art be damned – eight decades in, Liz Whitney Quisgard wants decorative work to finally get its due. Published on Friday, May 18, 2018. This article appears in the April/May 2018 issue of American Craft Magazine. 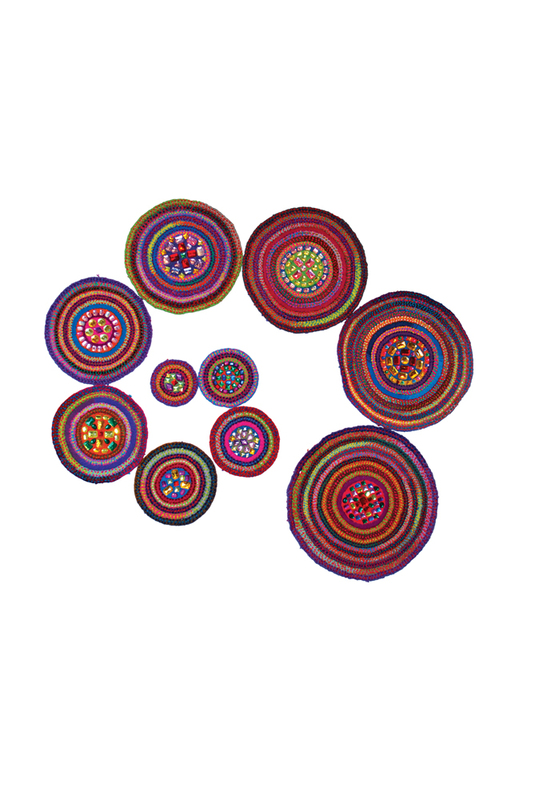 Hundreds of Circles, 2017, yarn, buckram, approx. 5 x 24 ft. There are other, more practical factors that led Quisgard away from painting, her primary medium for more than 50 years. Even with a large basement studio, it’s cumbersome to store and transport large canvases, and as she approaches her ninth decade, fiber is a more accommodating medium. But as motivations go, her appraisal of the state of modern painting should not be ignored. Shaping her legacy is as important to Quisgard now as at any other point in her career. In the 15 years since she began producing yarn-on-buckram work, her signature aesthetic has remained the same, with traces of Byzantine architecture and ancient Arabic patterning and iconography. Liz Whitney Quisgard’s straightforward titles belie her work’s sense of wonder and possibility. She can combine simple shapes in endless configurations. 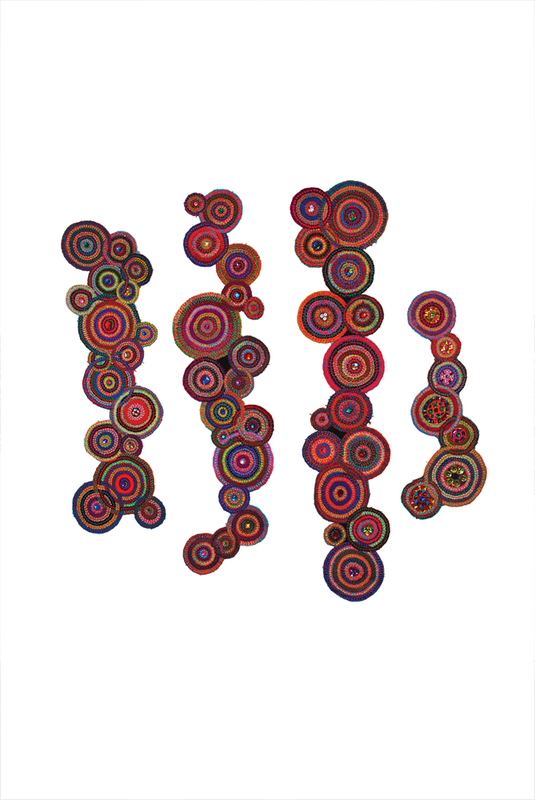 4 Ellipses, 2008 – 09, yarn, buckram, 4 x 2.5 ft. ea. 4 Wall Squares, 2004 – 07, yarn, buckram, 2.5 x 2.5 ft. ea. What emerged from the ensuing period was a deeper commitment to her philosophy of decorative art and the development of a style that continues to define her approach. “The strongest, most lasting influence on my work has been Islamic rugs,” she explains, recalling how she’d indulged in pricey antique Oriental rugs in her 30s. “I don’t copy them. I simply absorb them to such an extent that the idiom comes out in the work.” Her aesthetic was further shaped by a passion for architecture. 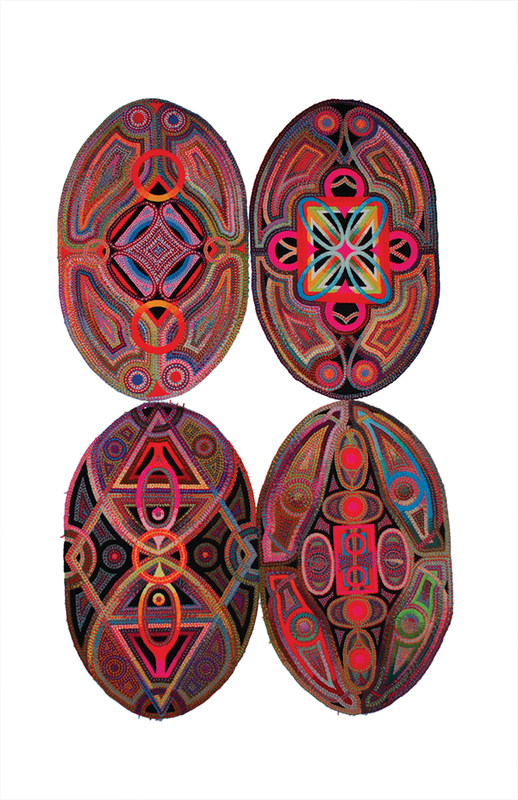 Quisgard’s fiber work makes manifest those varied influences. Her current displays are vast arrangements of small to medium pieces affixed to stretches of wall: Scramble (2017) features amoeba-like shapes nestled against and within each other, while Hundreds of Circles (2017) is … well, you can imagine. The assemblages were displayed at Kingsborough Art Museum in Brooklyn last year, concurrently with another show at the Quick Center for the Arts upstate (running through June 30). Though they form a whole, they retain some of Quisgard’s own stubborn independence; they’re like “an enormous picture puzzle that refuses to fit together,” she says.